This entry was posted on December 30, 2010 by ScanTool.net Team. We are honored to be mentioned in the January 2011 issue of Circuit Cellar. STN1110, our OBD Interpreter IC, is covered in the 'New Product News' section. 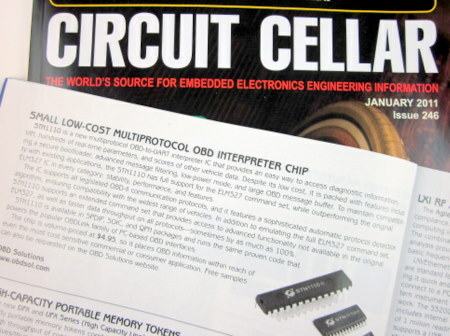 Circuit Cellar is the 'World's Source for Embedded Electronics Engineering Information', and we are pleased to have our product release covered by such a prestigious periodical. Pick up your copy today!